Welcome to Garden Bloggers’ Bloom Day for July 2011! Here in my USDA hardiness zone 5b garden, the coneflowers, Echinacea purpurea, are creating a swath of bloom that will carry that section of the garden through the dog days of summer. Echinacea purpurea is a good, sturdy, trustworthy, reliable flower, one that I think has been in my gardens wherever I’ve been for the past 25 years. It is almost like a backbone for the border it is in, the border called Ploppers’ Field. Further along in that border, some unnamed variety of common tall phlox, Phlox paniculata, blooms with Heliopsis helianthoides ‘Loraine Sunshine’. 'Loraine Sunshine' is the variegated leaf form of the rather common false sunflower and though “she” self sows herself all over the the garden, producing progeny that revert back to the plain leaf form, I let her stay not for her flowers, but for her leaves. And I resign myself to pulling out the plain leaf form of false sunflower wherever it shows up. 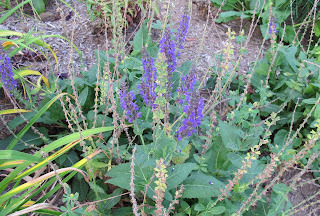 There are salvias starting to rebloom in July, after blooming in May. They would look so much nicer if the garden fairies would have dead headed them awhile ago. There are also blooms starting to show up in the new border called August Dreams Garden, but I’m holding off on showing any of those until next month. 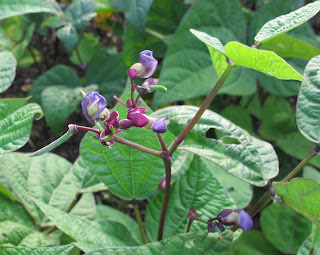 Out in the vegetable garden, I would normally be picking green beans about now, but because I planted everything a full two weeks later than normal, I am still watching the blooms of green beans and just now noticing the tiniest bean starting to form. It won't be long now before I will have some green beans to eat. 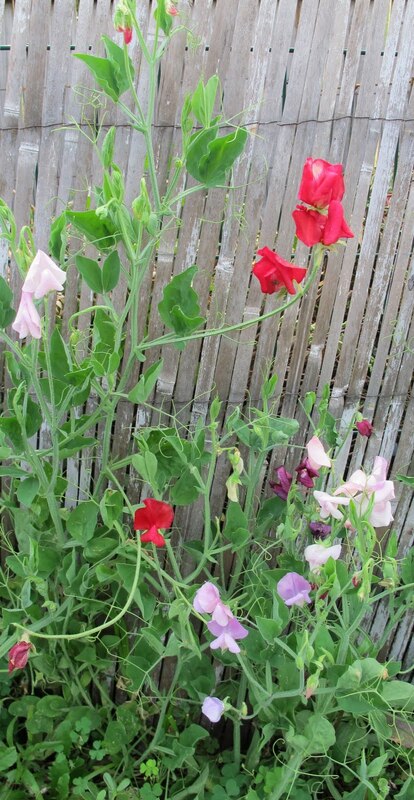 A bonus of my late sowing is that sweet peas planted by the compost bin are just starting to bloom. In past years, I would have already pulled these plants and thrown them into the bins by mid-July. There are more blooms in the garden – Rosa, Heuchera, Hosta, Hemorocallis, Hydrangea, Clematis, Cucurbita, Coreopsis, Lilium, Leucothemum, Zea – are some of the names I'd throw out at you if I was a botanical name dropper. But it is July and it is either too hot to spend too much time in the garden or it is a lovely day like today when the garden calls us to come out and weed and water it and deadhead those salvias and think about garden clubs and garden visitors, and plants and passions. What’s blooming in your garden under the full buck moon of July? Just post on your blog about what is blooming in your garden on the 15th of the month and leave a comment to tell us what you have waiting for us to see so we can pay you a virtual visit. Then put your name and the url to your bloom day post on the Mr. Linky widget below to make it easy to find you. The variegated leaves on Loraine Sunshine are stunning! I haven't deadheaded my salvia yet either, but no signs of a second bloom yet. Thanks for hosting, Carol. Hi Carol - Thanks for hosting and Happy GBBD! Hi Carol. Happy GBBD! Your gardens are looking lovely as always. It has been a great summer for blooms and thanks to you I have been taking a lot more notice! Beautiful Blooms! Thanks! Happy GBBD! Thank you for another fine GBBD. Your garden is looking really well this July. I like the image of the amorous bugs. That variegated leaf sunflower is a stunner. Looking forward to seeing the new August Dreams Border. Your variegated form of Loraine Sunshine is fabulous. How wonderful to see the Salvia patch blooming again and it's a delight to see your Sweet Peas in bloom. I wish I could grow them here, but I've had no success with them at all. I agree, it's hard to find a good time to garden in the heat of summer... I love early mornings in the garden--especially in July! Thanks for hosting GBBD! Thanks for hosting. I just love that word 'swath' especially when associated with those beautiful coneflowers. Enjoy your July. I like the idea of garden fairies who do deadheading :) Send some my way when you catch them. Happy Bloom Day! Your garden looks lovely despite the heat of July. Loraine Sunshine is awesome!!!! Wish you could bottle up that heat and send it to San Francisco. It's been the usual 58 degrees & foggy in our garden... Happy Bloom Day! The foliage to your false sunflower is quite stunning. Can't wait to see the August Dreams border! I love those purple coneflowers. I got my beans in late, too, and they are just about to bloom. I am excited, because I haven't had beans from my own garden for a number of years because rabbits have eaten them down to nubs. We now have chicken wire all around the chain link. I posted photos of what's blooming on the east side of our house, since I have already been posting photos of other blooms in the yard. Your Ploppers' Field is lovely Carol. It has such a wonderful, informal, naturalistic cottage-garden style. Love it! I love that you're showing off some veggie blooms too. Those purple bean blossoms are so pretty. Thanks for hosting GBBD! I managed to find some blooms willing cooperate even in 100+ temps for weeks on end. Now I think I'll just stay inside and look at everyone else's blooms :-) I think my whole garden could be classified as a Ploppers Field. Thanks for starting this thread. It gives me the discipline to take inventory each month. Also, to see what's blooming in other parts of the country. Nice to hear you're having some nice days to enjoy and work in the garden. Way too hot here for that but some of the sturdy annuals are holding up nicely. Thanks for hosting. It's always a pleasure to see what others have blooming! Thank you very much for hosting GBBD! Your garden is very beautiful. I love the flower bushes, the pretty blooms and the unusual foliage. Pt's always good to see what else is growing at this time - thanks for hosting this. Everything looks wonderful! I enjoyed your article in Horticulture too. The varigated leaves of false sunflower are as lovely as the flower! Happy Blooms Day Carol! I love your Echinacea Carol :) Note to self: must plant more of them in my garden. Happy Blooms Day everyone and I'm looking forward to meeting a number of you in Seattle next week! Lovely plants. I bought a yellow Echinacea this year but I really admire your Echinacea purpurea (on my list!). All the best, Kelli. Echinacea is one of the best in my garden too, I´m having the white one ,-)! Thanks for hosting GBBD, I really appreciate this! Echinaceas are always lovely, however they are temperate clime plants. I have an unusual post for bloggers this time, so i posted only one plant instead of the normal many plants in one post. I have grown the species Echinacea for years, and I could not concieve of a garden without them. The newer cultivars in all those wonderful colors have died every time I have planted them, yet the species has been in the garden for nearly 15 years. I visited a friends garden who had quite the collection of the new ones. He said you need to only plant them in the spring and cut off all flower stalks prior to blooming for the first summer. After that they are truly perennial. Thanks for hosting Bloom Day, especially for my favorite month. Love those heliopsis. I think I must be a yellow and orange kinda girl - those hot colours always brighten my day! Lots of long blooming plants in action in my garden. Happy GBBD. Hi and Happy GBBD! It is lovely to be back to visit old friends here, especially you, Carol. Glad to see many new blogs participating too. Your garden is totally summery. Lovely! The Coneflowers are spectacular this year in my garden, too. Thanks for hosting the Bloom Day! Happy Bloom Day! I had no idea beans had such pretty flowers. Beautiful blooms! Thanks for hosting GBBD! Nice blooms all around your garden! I guess I should cut back my dark purple salvia, to help them rebloom, but I kind of like the seed heads! I love Echinacea! yours look so great in a mass like that. Also love the color combination with the phlox and the heliopsis. So pretty! How can it be the middle of summer? How can it be the middle of July? How can our gardens be so beautiful? All mysteries. All so true! I need some garden fairies, too. Thanks for hosting. Echinaceas are the backbone of my summer garden, too; I can't imagine my garden without them. I can't believe I'm ahead of you for once, Carol--I picked the first green beans last week. They've been on our dinner menu nearly every night since. Happy Bloom Day! How kind of you to share such beauty! And to inspire me. I must make an effort to have such blooms next year, especially the purple coneflower. I am also encouraged with the veggies. I planted my cucumbers a second time, well into the season, and I'm obviously impatient. Enjoyed your blooms! I hope our echinacea looks as pretty as yours when it comes into full bloom! Thanks for hosting this - it's a great chance to appreciate what's happening in the garden each month. Those sweet peas are so pretty and such a surprise at this time of year. Makes me think I should try them and plant a succession of seeds to get a longer bloom from them. Happy GBBD. I love your echinacea section. And as a veggie gardener, I love many of the blooms that vegetables produce. I don't have too many flowers blooming right now, but I'm hopeful for next GBBD. Thanks for hosting! Our echinacea are not out yet. Hopefully next month. A treat in store! wonderful blooms you got there. happy GBBD and thanks again for hosting! happy gardening! Happy GBBD! I wish I had beans ripening. Darn those bunnies. Love the heliopsis and phlox...lots of beautiful blooms...happy GBBD!! 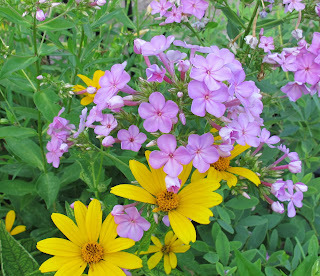 I like the combination of the tall phlox with the false sunflower. Very nice together. Happy Bloom Day! 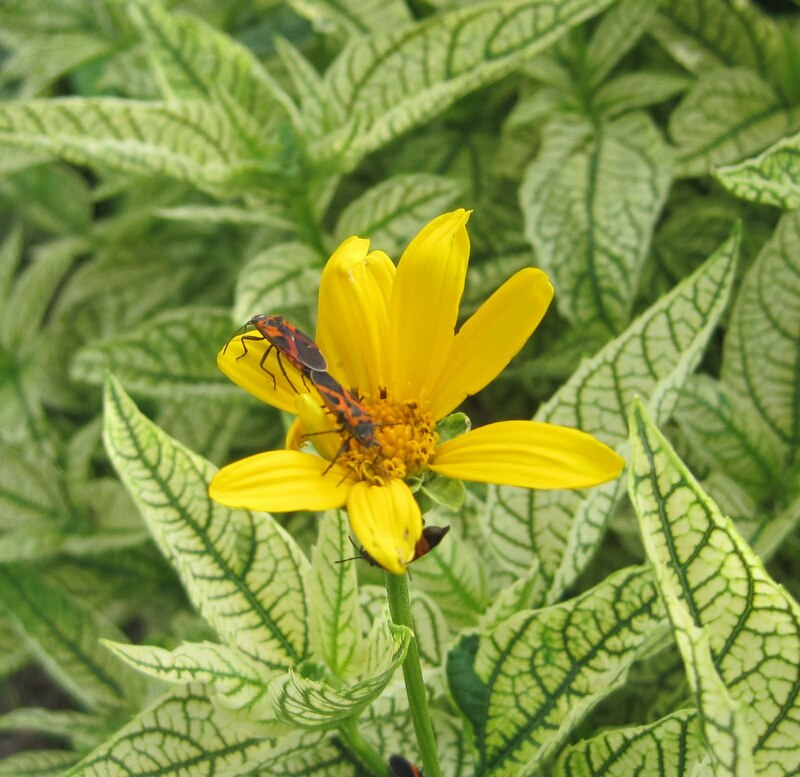 I love the combination of the Phlox paniculata, with Heliopsis helianthoides ‘Loraine Sunshine’. So pretty! How can anyone call that beautiful phlox common? My mother has some Loraine Sunshine (also with the variegated leaf), from my grandmother, and now I hope to have some, too. Just love seeing it bloom in your garden! You show good choices for a July garden. Reminds me that my phlox needs to move to more sun. Thank you for hosting Bloom Day. It is always a treat. Rain has arrived here. I took okra pics as the raindrops started. Beautiful coneflowers. My couple plants are so tired looking already. Thanks for hosting. Hi Carol! Being in Northern Kentucky, I guess we are not that far from you. We have many of the same border flowers in our yard as you. 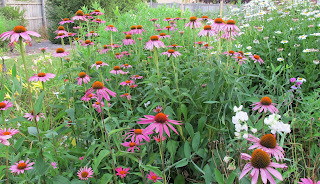 You can't beat coneflowers and phlox for hardiness and longevity! Happy July GBBD! This is my first Bloom Day of (hopefully) many! Happy Bloomday! We've yet to really heat up here in Portland (Oregon)...July isn't really here yet! I'm lovin' the 'Loraine Sunshine'! This is the year for Echninacea, isn't it?! Looking good in my garden and getting multiple blooms. Some call it "common" - but I cannot get enough. Love yours, Carol, and those of many GBBD contributors. You are so right about Echinaceas being the backbone of the summer garden. What would we do without them? Your garden is looking very pretty. I sowed my beans late too, and just now they are blooming. The birds ate a few of the seeds, or they didn't germinate, so I have spotty plantings. Still, it will do. I may also sow another variety. I love them. For some reason, the purple coneflower I planted last year didn't survive. Happy Bloom Day! Glad my beans aren't the only late ones. I have softened on echinaceas, but they better be looking as good as yours in August! Thank you so much for hosting! I can't wait to see what everyone else has going on! Your garden looks lovely - but I'm glad it's not just my garden fairies that are slacking. I was beginning to take it personally! I am so happy I discovered your whimsical blog and thank you for creating this wonderful online community. Nice to see all of the wonderful things blooming in everyone's garden. July is the beginning of our long, hot and dry season. This means there is less and less in bloom in an unirrigated (or little irrigated) southern California native plant garden - a subdued, quiet garden, beautiful in its own way. Love that variegated sunflower but if she likes to seed everywhere I'll refrain, got enough of those loose plants. Carol, We've both got a sea of echinacea - I love it. I love that variegated sunflower too and I'm going to have to add it to our list. I love self-sowers - free plants! Love the Heliopsis! I, too, am enjoying my sea of Echinacea. Thanks for hosting! I agree, coneflowers are wonderful. For us they don't make it through to the fall although when I cut them back they do bloom again. But nothing like that first profuse blooming. I really would like to try some of the other varieties, although so far only white swan has been a success. Happy bloom day Carol-see you in Seattle. The season has been unkind for my kitchen garden, but things dried out in time to plant summer crops. So, while I harvested almost nothing in the spring, late summer and fall look very promising. I hope everyone else is happy with their gardens this year! I need my garden fairies to do more deadheading, too. I don't know what a buck moon is! What kind of gardener am I?? Thanks for another GBBD. I love that red sweet pea! looking good up there carol! see you in seattle! You've had a wonderful Bloom Day response. My morning started out rainy and I had to alter my Bloom Day intentions because the butterflies would not come out and play. They came out with the sun this afternoon so I put them on Dotty Plants blog. I also wish the garden fairies would keep up on the deadheading. They have been slacking here as well! 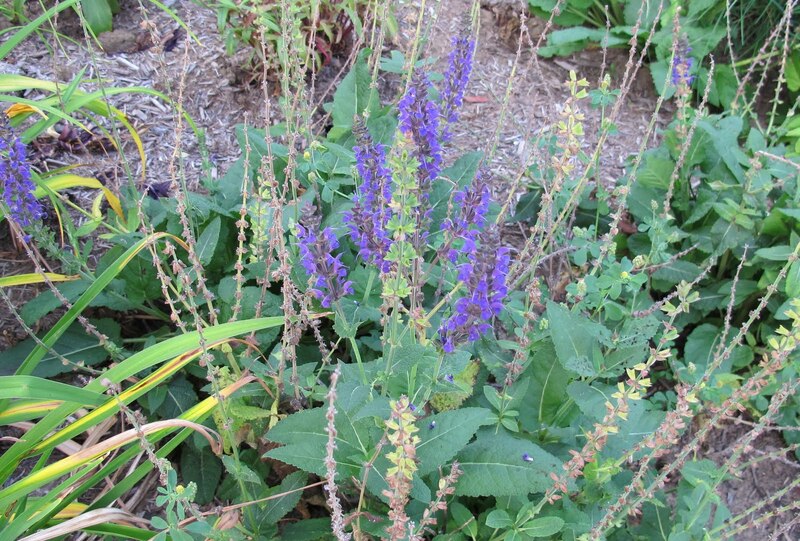 Does your salvia often go through a second blooming? The sweet peas are wonderful. When you say you sowed the seeds late, when did you do so? I often wondered how late I could get away with planting annual seeds. Thanks for hosting! A lovely backlit spray of Double Delight roses in full, perfect bloom is waiting for you! I don't what my problem is, but I just don't have good luck with echinacea purpurea. Yours are beautiful! Happy GBBD and thanks for hosting! My post is now up. A Goth garden for Bloom Day. The lily I grew from seed that my grandmother gave me is blooming. I'm thrilled! Happy bloom day! That first photo is stunning...love all those Echinacea! It's a beautiful buck moon, isn't it, Carol? And the July blooms are glorious! Lots of flowers are blooming now, I couldn't even post them all, but thought I would also post some of those mouth-watering berries that are fruiting now for some appeal to some of the other senses as well. Lot's of lovely blooms in your garden this month. I am green with jealousy over that Loraine Sunshine. Boy is that ever fabulous. And of course the coneflowers and the phlox, and...well, all of it! Sorry I'm late ... but I'm soaked! Sweet peas in July! Love the swaths of echinaceas and wish I could make this plant happy in my garden. Happy July Bloom Day! 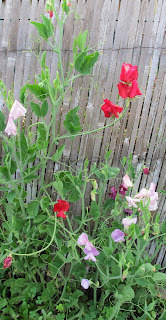 I'm loving the bright colors of your sweet peas - mine have all turned out pale violet to white! At least they are sweetly fragrant. Happy belated Bloom Day, Carol! thanks for the link widget... i messed up and did it twice, so 168 can be deleted! thanks! Whew, your participant list is getting long Carol! I'm late as usual but at least I made it this month. Love all the variety you've got going. I don't have much variety right now. It's going to have to get cooler and wetter for that! Thank you so much for A WONDERFUL party! I've made new friends, learned some new facts, and am a little exhausted from all of the visiting and commenting, lol. You my dear are a very inviting hostess and we appreciate it! I sure wish I could grow Phlox paniculata out here in foggy CA! I have fond childhood memories of it being one of the few things growing in our hot Texas garden. I love to see sturdy and dependable Echincea and Phlox looking so happy for you, Carol - they're barely hanging on here. And your sweet peas! Wow! My July GBBD post is finally up. Our July GBBD is on our Flickr page at http://www.flickr.com/photos/localecologist/sets/72157627215436250/. Another johnnie-come-lately here.... hectic week with a summer festival in town and lots of company. But I finally got my post up. Thanks so much for hosting, Carol! I'm late on this but I did take the photos on the 15th. Your place looks great, Carol! Everyone else has such lovely gardens. I thought I would join the fun and start sharing what is in my garden as well. So, here is my first report about what is blooming in my Zone 8 garden this summer. Those are beautiful flowers. Photos were captured nicely. Beans! After the rain last night, you will be harvesting soon, yes? Mine were all eaten by a ground HOG! i hope it's better late than never! thanks for doing this every month, carol. it is always fun to look at everyone's blooms. Dear Carol, thank you for organizing and hosting GBBD. I wish I had joined this years ago but as Daricia says - better late than never!